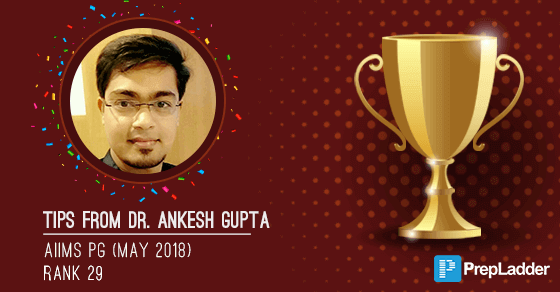 PrepLadder congratulates Dr. Ankesh Gupta on securing Rank 29 in AIIMS PG May 2018. We wish him all the best for his career and future ahead. In this exclusive interview with PrepLadder, he shares the plan that worked best for him to help you achieve your dream PG seat. My name is Ankesh Gupta, I graduated from Baroda medical college, Vadodara. My AIIMS PG rank is 29. What do you think is the correct approach to study for AIIMS PG? Only MCQ's or Theory+MCQ's? The correct approach is to follow standard textbooks (only imp topics), MCQ practice and previous 3-5 year papers of AIIMS, PGI, JIPMER are very important. I finished my USMLE exams on 30th Jan 2018. I started studying for AIIMS from 2nd Feb 2018. ANATOMY- Grey's Anatomy flash card, Uworld and Qmax, neuroanatomy from vishram singh. ENT- Dhingra, AIIMS, JIPMER papers. Have you attempted any PG exam previously? No, this is my 1st attempt. How big is the role of practice and revision while preparing for AIIMS PG and how much time should be dedicated for it? Once basics are strong then 90 days are enough for AIIMS, for me dedicated AIIMS prep started from 2nd Feb and continued till 5th May. Last revision of all subject within 10-15 days plays a great role. Yes, PrepLadder helped a lot to understand Indian PG entrance pattern. Specially AIIMS grand tests. I also learnt how to manage time through PrepLadder tests. Yes, I dedicated 4 hours daily for AIIMS, JIPMER and PGI papers, 4 hours for clinical science and 4 hours for basic science. Were you a topper or a mediocre student during MBBS? I was an average student. One mistake that you believe everyone must avoid while preparing for AIIMS PG. Not going through previous year papers is the biggest mistake you can make. While you’re going through previous year’s papers, also try to explore the incorrect options in them. How many questions did you attempt in AIIMS PG? I attempted 192 questions in the exam. Some last tips for our readers preparing for PG? Enjoy your studies, work hard, believe in yourself, fight till the last Question of PG entrance test. Best Wishes for PG entrance.